ARTS is pleased to make its recent content available online. 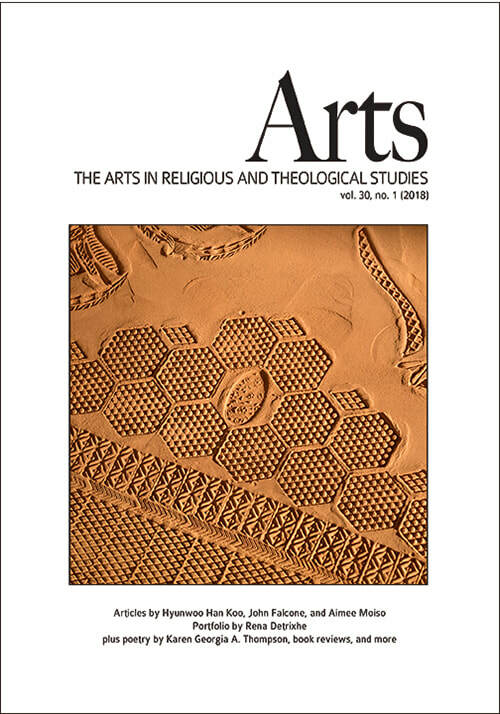 This issue, guest edited by Joyce Mercer, features articles from presentations given at the Association of Practical Theology conference on "Art and Social Transformation" (Yale Divinity School, April 2018). The cover and portfolio features the work of artist Rena Detrixhe. Karen Georgia A. Thompson contributes three poems. Hyunwoo Han Koo contributes an article about the comfort women statues in Manhattan and Seoul. Deborah Sokolove and Amy E. Gray created a collaborative, interactive installation for the conference, and they write about their process in an article called, "For the Healing of the World." Ruth Illman and W. Alan Smith discuss how the Interreligious Choir of Frankfurt, Germany, builds community across lines of difference. John P. Falcone describes how sculptures created in the Theatre of the Oppressed shape peacemaking. Aimee Moiso argues that up cycling can change the world. And in a special, online-only article, Susanne Johnson expresses how liturgy on the border enacts social transformation. In this issue, Richard Rosengarten invites readers to consider retablo as the theological architecture upon which Frida Kahlo painted her autobiographical works. Jeffrey Brackett wrestles with whether his mandalas are necessarily “spiritual” in his reflection for “in the studio.” Helen Boursier shares her experience of working with women in an immigrant detention center on the Mexican border. Martin Shannon and Mons. Timothy Verdon outline how the Mount Tabor Ecumenical Centre for Art and Spirituality was born. We are very pleased to include a new short story with an accompanying image by artist and culture critic Bob Haverluck. Patrick Beldio and Kiki McGrath pick up commentary on the 500th anniversary of the Reformation by describing their curation of a show on the subject which was mounted at the Dadian Gallery at Wesley Theological Seminary. And Mark McInroy rounds out the issue by noting the contents of three new titles in theology and the arts. This issue of ARTS, with guest editor Wilson Yates, features a portfolio of images by Jewish artist Carole P. Kunstadt who is attentive to memory and history in her works. 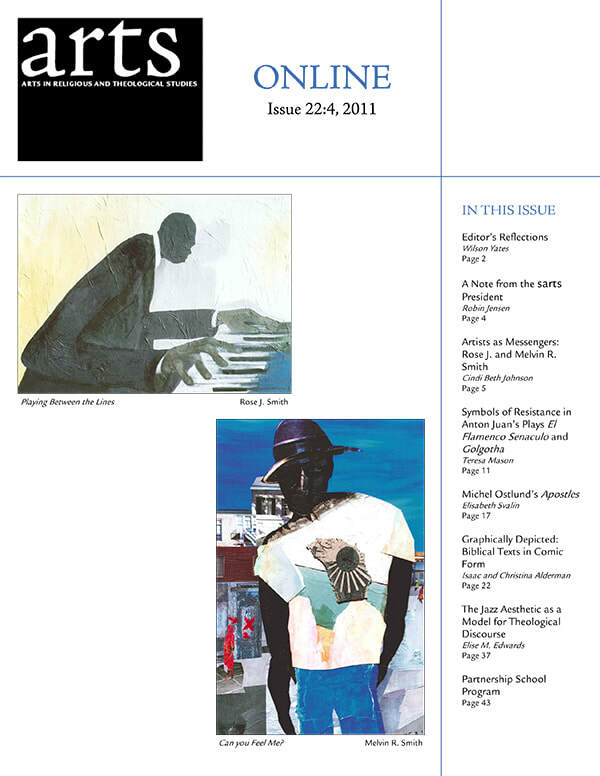 The issue includes five poems by renowned poets. Robin M. Jensen contributes an article on the cities of Jerusalem and Bethlehem in the mosaics of early Christian churches. Jennifer Awes-Freeman writes of the importance of materiality in Christian life and worship. John Randolph LeBlanc and Carolyn Jones Medine write of Paletine by reference to the cultural criticism of Edward Said and the photography of Jean Mohr. Artist James B. Janknegt reflects on his development as a painter treating Christian subjects. John Shorb interviews artist Nazanin Hedayat Munroe, and Wayne Roosa reviews Kimberly Vrudny's new book, Beauty's Vineyard. In this issue on the "aesthetics of silence," the portfolio features the work of Y.Z. Kami. Mark Burrows curates six poems. Michael Hebbeler, of the Center for Social Concerns at the University of Notre Dame, describes how art informs a seminar he teaches in discernment. Artist and art critic Jonathan A. Anderson writes of musician and composer John Cage. Brian Kirby reflects on the importance of silence for the Taizé community in France. Theologian Mark DelCogliano writes about his experience of silence when he lived for a time as a Trappist monk. Colleen Carpenter connects the themes of silencing and justice in her essay on the pink crosses that mark the feminicide that is happening in the midst of the drug war in Mexico. Biblical scholar David Penchansky offers a review of the film Silence. John Shorb’s interview with Hratch Arbach, Jennifer Awes-Freeman’s review of the Minneapolis Institute of Art’s exhibit about Martin Luther to mark the 500th anniversary of the Reformation, and Mark McInroy’s book notes round out the issue. In this issue, we are introducing a new portfolio section with Cory Dugan’s Gospel series entitled “Hapax Legomena,” a Greek phrase referring to words that appear only once in a text. Poetry editor Mark Burrows curates four poems by Barbara Crooker, Philip C. Kolin, Susan Miller, and Suzanne Underwood Rhodes. Randall Lindstrom provides a tribute to the late Rev. Dr. Patrick Negri, an Australian priest and artist who was a longtime friend of this journal. 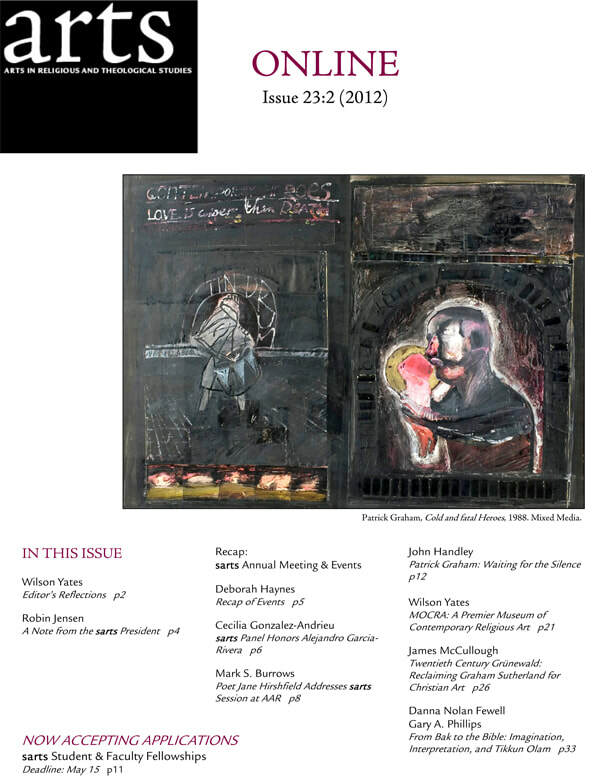 Mark Burrows’ article, “Seeing Through Words,” which is on poetry as a visual art, also appears in this issue. Matthew Plescher’s work is featured in our “in the studio” section, and Tonia Colleen Martin is “at the drafting desk,” exploring writing as an act of incarnation in a more experimental way. 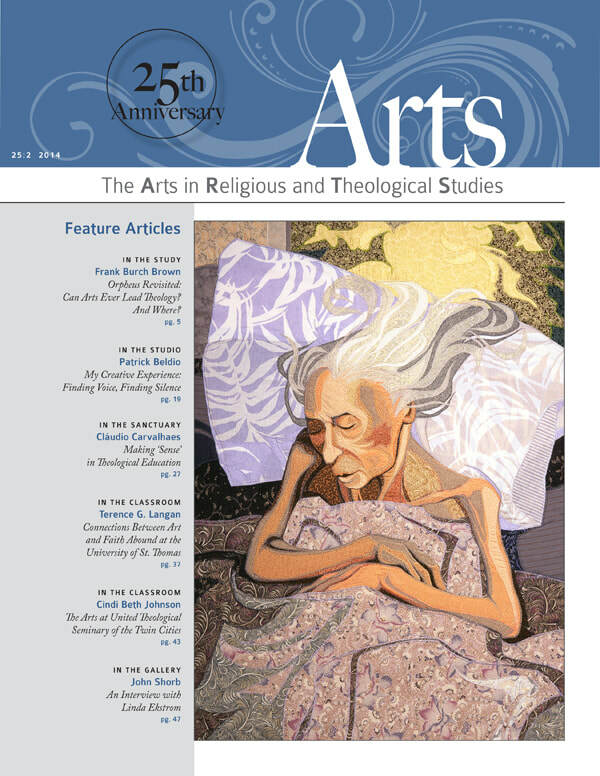 John Shorb interviews Meg Hitchcock, whose work is featured on the cover of this issue; Wilson Yates reviews a title by Aaron Rosen; and Mark McInroy wraps up the issue with notes on three recently released titles in theology and the arts. 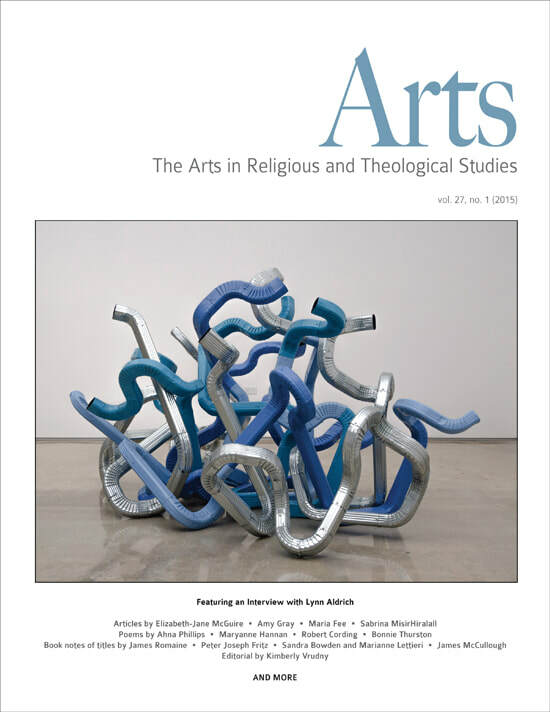 This issue features the piece Mary as Prophet, a sculpture by Margaret Adams Parker installed at Virginia Theological Seminary. Peggy Parker discusses her own work, followed by a photo essay by B. Cayce Ramey treating Parker’s prophetic creation. Also in this issue, Australia-based theologian and musician Maeve Louise Heaney attempts to articulate how those who have a hyphenated existence as both artists and theologians hold great promise for the theological enterprise. Mark Burrows curates four poems by Jennifer Wallace, Regina Walton, Angela Alaimo O’Donnell, and Harold J. Recinos. Mark McKim, a Canada-based minister, reflects on how the play Tuesdays with Morriedemonstrates how the central symbols of the Christian story no longer resonate with western culture, and he proposes ways to think about Christianity anew. 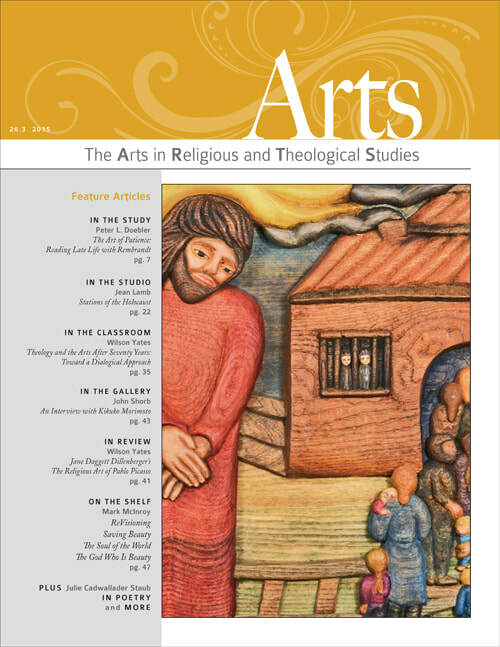 Mark McInroy rounds out the issue with notes about four new titles in theology and the arts. We have assembled this issue as a means to direct attention to the power of art to open paths of peace where previously none could be imagined, and to put a spotlight on the beauty and wisdom of Islam. The issue opens with Deborah Sokolove’s review of Shirin Neshat’s Facing History exhibit, recently on view at the Hirshhorn Museum. Eight poems by SAID, treating such themes as desire and mourning, are translated by our poetry editor, Mark Burrows. Next, a London-based researcher, Rosalind Parker, considers the British Museum’s mounting of an exhibit about the Hajj. Lastly, we are publishing an article by Meena Sharify-Funk, who discusses how Sufis were vital to the development of letter mysticism in Islam. John Shorb contributes an interview with Saudi-American artist, Hend al-Mansour. And Mark McInroy rounds out the issue with two new titles in theology and the arts, both with a focus on Islam. In this issue of ARTS, we are featuring an interview that John Shorb conducted with Los Angeles artist Lynn Aldrich. The issue opens with Elizabeth-Jane McGuire’s exploration of the music of Ralph Vaughan Williams, whose own spiritual journey maps convincingly to compositions he was writing in the early twentieth century. We also are pleased to publish in this issue poetry by Ahna Phillips, Robert Cording, Bonnie Thurston, and Maryanne Hannan. Amy E. Gray contributes reflections of her dual calling to Christianity and to art. Maria Fee writes about artist Natalia Goncharova’s prophetic stance in Russia on the eve of the Revolution. Sabrina D. MisirHiralall offers a piece on the pedagogy of mindfulness, in which she speaks of insights by Vietnamese Zen Master Thich Hạnh that she then applies to Kuchipudi Indian Classical Hindu Dance. 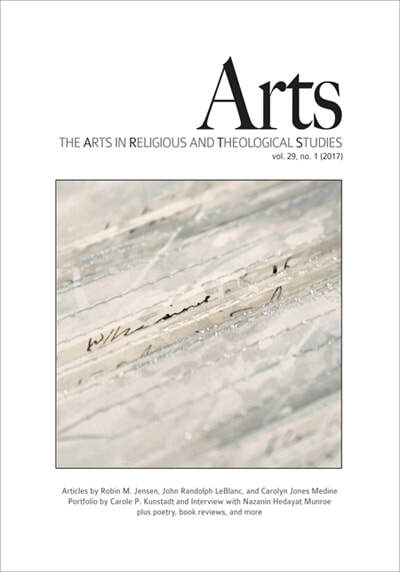 Mark McInroy rounds out the issue with notes on four new titles in theology and the arts. This issue demonstrates our continued commitment to social justice with its feature article on the Stations of the Holocaust by Jean Lamb. The English artist contemplates each Station in light of the impact of Jesus’ betrayal on the history of the Jewish people. This issue also looks intently, and in varying ways, at the end of life. Wilson Yates memorializes two giants in the field of theology and the arts whom we have lost: Tom Devonshire Jones and Jane Daggett Dillenberger. Peter L. Doebler offers reflections about the effect of aging on Rembrandt’s approach to the figures of Simeon and Anna. Julie Cadwallader Staub gives us five poems on grief and loss. We are also publishing Wilson Yates' keynote address from the 2014 SARTS meeting. John Shorb interviews artist Kikuko Morimoto. 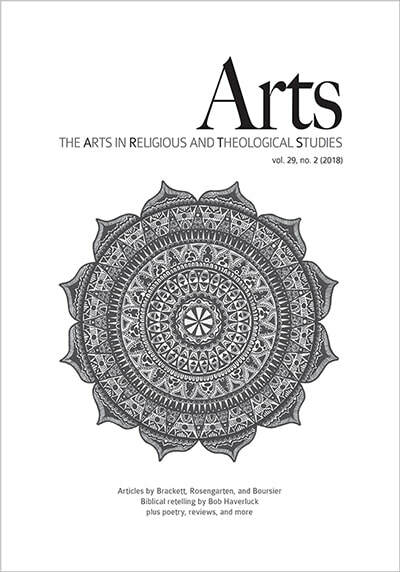 Guest edited by Maureen H. O’Connell, this issue makes connections between critical race theory, theological aesthetics, and the arts. Philosopher George Yancy gives us a prophetic primer on the basics of critical race theory made evident in the lived reality of three Black men killed by law enforcement. Aimee Meredith Cox, an anthropologist and former dancer with the Alvin Ailey company, turns our attention to the resilient beauty of captivating choreography. Valerie Bridgman takes us back to the tumult of racial integration in the south with two original poems, while Malik JM Walker pulls us into the liturgical spectacle of the jazz funeral in New Orleans. Teaching scholars map out ways that they have used the arts for promoting racial justice. John Shorb interviews Kellie Jones about an exhibit titled, “Witness: Art & Civil Rights in the 60s." In this issue, Jason Steidl reflects on “Sacred Harp Singing and the Christian Eschatological Imagination." Art historian and cultural theorist, Jonathan Koestlé-Cate, provides us with a look at Patrice Moor’s Stations of the Cross. The issue is graced with poems by Jane Hirshfield, Fr. John Julian, Sofia M. Starnes, and Diane Vreuls. Eric Worringer invites us to consider the pastor as curator of encounter. Art historian Rachel Hostetter Smith identifies some key strategies for transformative travel programs. John Shorb interviews Jennifer Scanlan, the curator behind “Back to Eden: Contemporary Artists Wander the Garden,” mounted at the Museum of Biblical Art. And, to round things out, Lynda Sexson reviews Brent Plate’s, A History of Religion in 5½ Objects, and Mark McInroy offers notes on five new titles in theology and the arts. 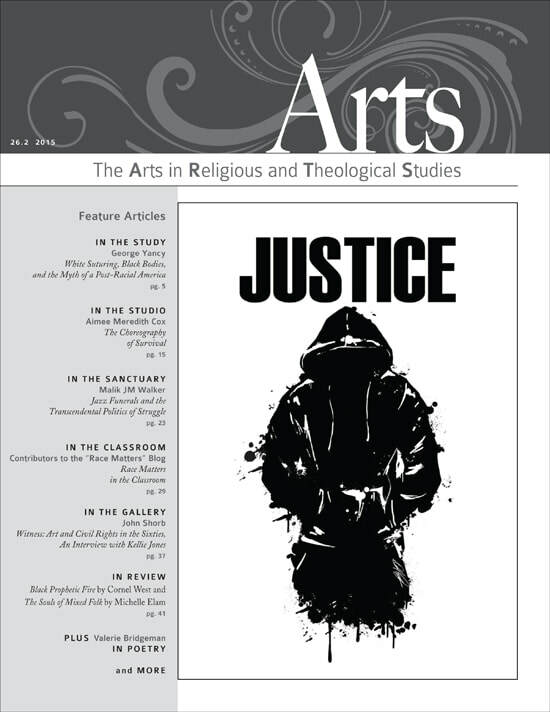 This issue balances traditional scholarship with prophetic attention to justice in face of the world’s need. We open with Andrea M. Sheaffer, who examines the story of David as an archetype after which, she argues, the story of Judith is crafted. Next, Ginger Geyer takes readers into the mind of a modern-day sculptor experiencing a paradoxical arts residency in Rome. Dean Seal highlights his ministry through Spirit in the House, Inc., and its Forgiveness 360 project, where the meaning of forgiveness is explored through drama and storytelling. In a similar vein, John Shorb interviews installation artist Mandy Cano Villalobos, whose work is calling attention to the murders that are occurring in Juarez, Mexico. We are also lifting up newly released books in the field of theology, religion, and the arts. 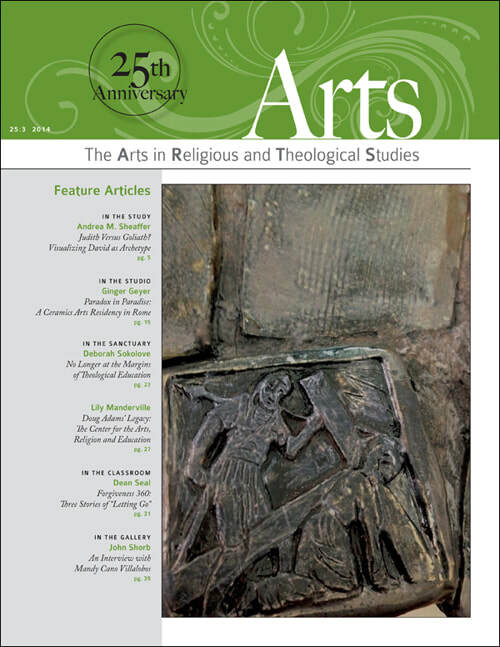 In this issue, Frank Burch Brown contributes “Orpheus Revisited: Can Arts Ever Lead Theology? And Where?" At the meeting, David Brown, Maeve Heaney, Larry Bouchard, and Russell Re Manning each also responded to Frank Burch Brown’s comments, and their papers are only published in this online edition. Also in this issue, Patrick Beldio speaks of the intoxicating joy and creeping disappointment of finishing a work. Cláudio Carvalhaes writes of the problematic hierarchy that exists within theological curricula, and seeks to equalize the playing field through a retrieval of the senses. John Shorb profiles the work of Linda Ekstrom. We round out the issue with Wilson Yates’ review of Rosemary Crumlin’s book about the Blake Prize in Australia, and with reviews of two books by William Dyrness, in addition to book notes compiled by Mark McInroy. This issue marks our 25th anniversary. Cambridge University scholar, Graham Howes, challenges some mainstays in the religion and arts dialogue. We publish three poems by Pamela S. Wynn. Charles Pickstone examines the revolutionary dimension of the work of four artists. Jim Malone, former Dean of the Medical School at Trinity College, Dublin, writes of John Synge’s painting, Schrodinger in the Hand of God, as a means to explore the importance of creativity in science as in art, and to foster a contemplative spirit in both science and art. Bobbi Dykema explores artist Mel Ahlborn’s appropriation of the Roman Catholic tradition of supplication to the Virgin in face of serious illness. Canadian artist Bob Haverluck retells the story of King Nebuchadnezzar in word and image. 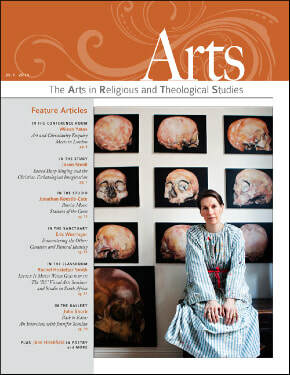 Finally, the issue reviews recent titles in theology and the arts. 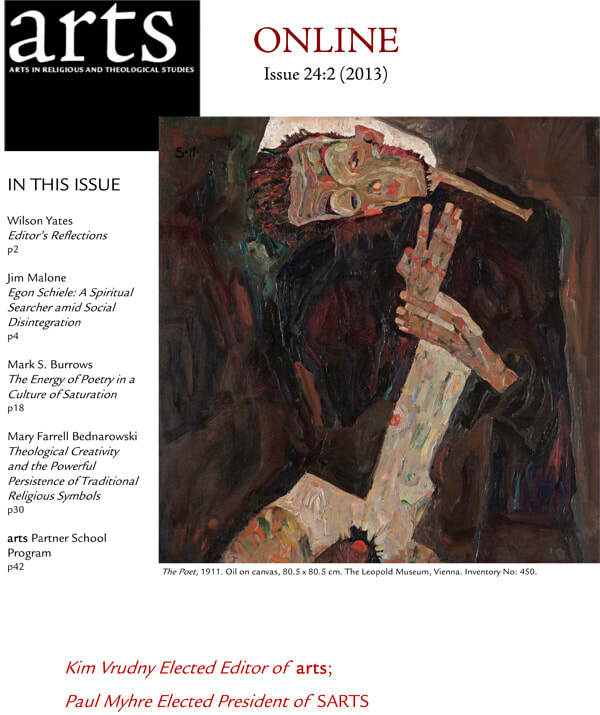 In this issue, only available online, after a reflection by Editor Wilson Yates, Jim Malone writes of artist Egon Schiele's work as a spiritual seeker amid the social disintegration of his time. Mark Burrows writes of the energy of poetry in a culture of saturation. 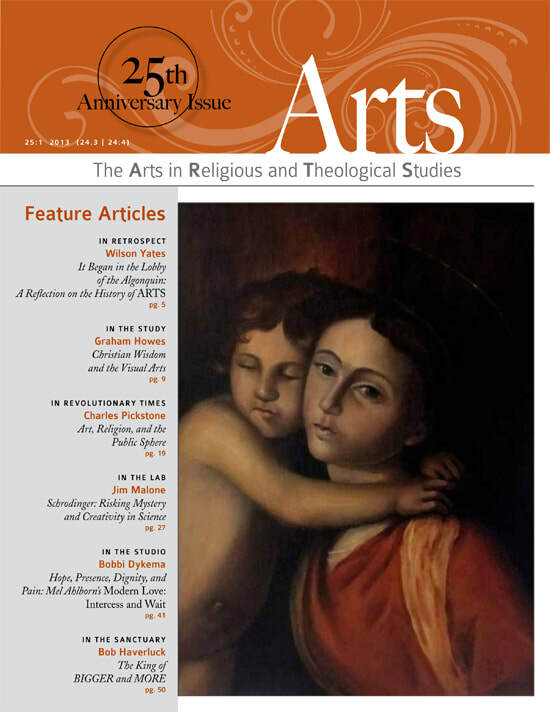 ARTS reprints an article by Mary Farrell Bednarowski who reflects on theological creativity and the powerful persistence of traditional religious symbols. In her article, she examines the power of art to offer anew symbols that engage us in transcendent ways. In this issue, only available online, after a reflection by Editor Wilson Yates and a note from SARTS President Robin Jensen, Joan Carter reflects on an image of the Peaceable Kingdom by Edward Hicks. 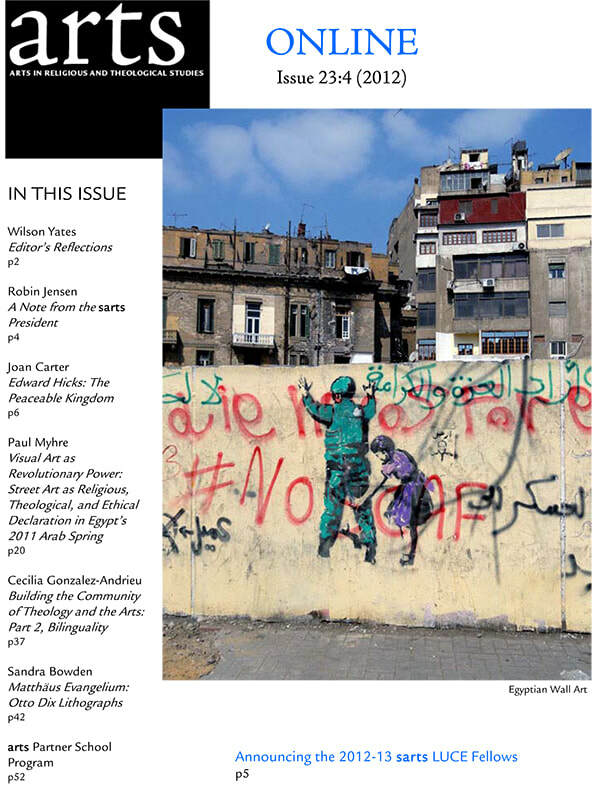 Paul Myhre contributes an article on street art as declaration in the Arab Spring. Cecilia Gonzalez-Andrieu writes of bilinguality as central to the task of building the beloved community. And Sandra Bowden reflects on lithgraphs by Otto Dix. 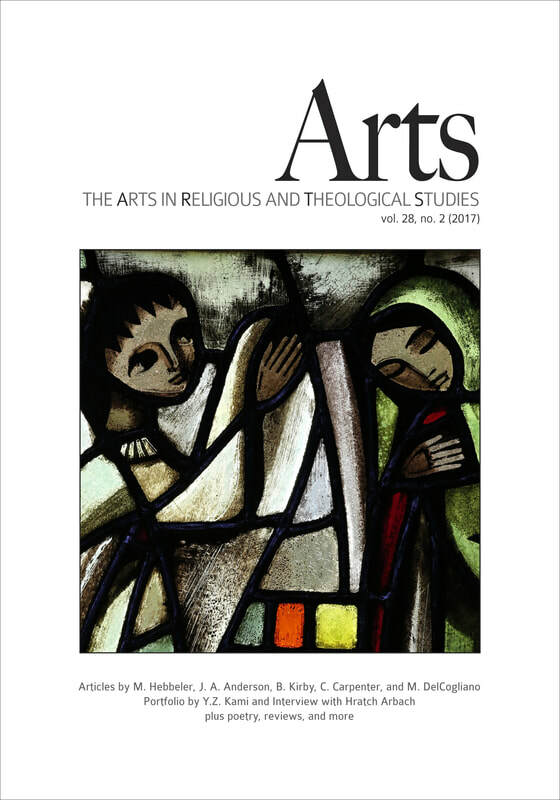 In this issue, only available online, the editors recap the annual meeting of the Society for the Arts in Religious and Theological Studies. John Handley writes about Patrick Graham's work, Waiting for the Silence. Wilson Yates pays a tribute to the Museum of Contemporary Religious Art in St. Louis. James McCullough reclaims Graham Sutherland as a Christian artist. ARTS reprints Donna Jolan Fewell and Gary A. Phillips' article about Jewish artist, Samuel Bak. 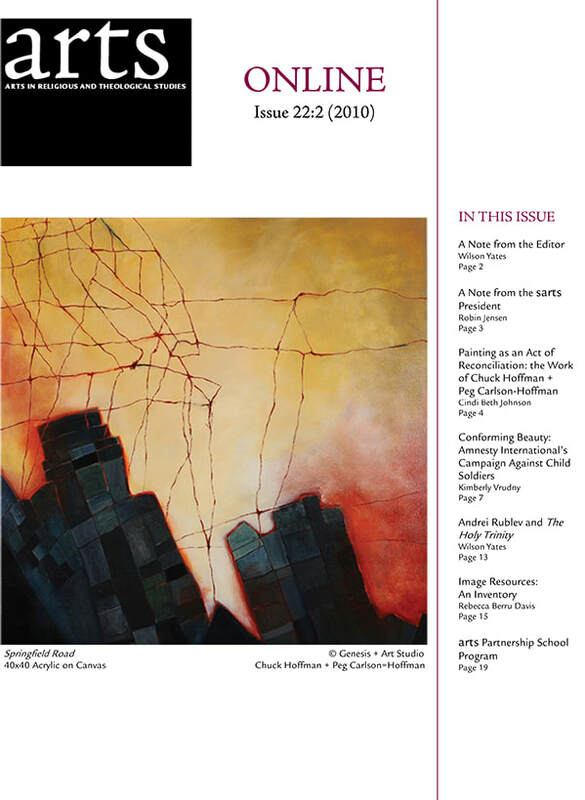 In this issue, only available online, after hearing from SARTS President Robin Jensen, Cindi Beth Johnson contributes an article on the prophetic art of Rose J. and Melvin R. Smith. Teresa Mason writes of symbols of resistance in Anton Juan's plays. We reprint Elisabeth Svalin's work on Michel Östlund's work, Apostles. Isaac and Christine Alderman publish a piece on biblical texts in graphic novels. And Elise M. Edwards offers the Jazz aesthetic as a model for theological discourse. 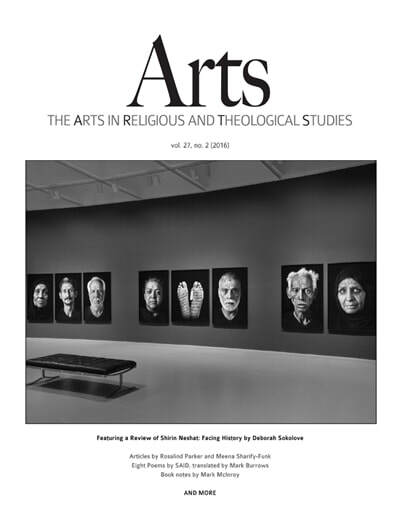 In this issue, only available online, we have a welcome from Robin Jensen, President of the Society for the Arts in Religious and Theological Studies. The issue also features an article by Cindi Beth Johnson on painting as an act of reconciliation, based on the work of Chuck Hoffman nad Peg Carlson-Hoffman. Kimberly Vrudny contributes an article on racism implicit in an ad created by Amnesty International. And Wilson Yates reflects on Rublev's icon of the Holy Trinity.